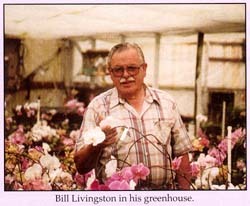 Orchid Digest Editorial Note: At the time of Bill Livingston's untimely death he was busy working on a book recounting his experiences with growing and hybridizing phalaenopsis. One of these chapters concerned the role of species in modern hybrids. Bill's wife Mollie brought the manuscript to our attention and it was obvious that the chapter on species' influences would be ideal for this special issue of the Orchid Digest. 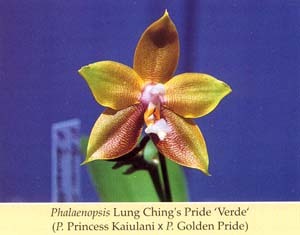 It summarizes a lifetime of experience and distills useful information for both phalaenopsis breeders and orchid judges. This article is an alphabetical listing of species and their breeding characteristics. Bill's use of species names follows earlier authorities such as Sweet (1980). Some of the subspecies he refers to have been raised to species status in the more recent taxonomy of Christenson (2001), which is the benchmark work on this genus. I FEEL THAT I SHOULD PRESENT TO YOU the species that I and other hybridizers have used over the past thirty some years. You will be able to use it to cross reference the old names with the new names which will be coming up. I hope to make it a little more interesting by including historical items and personal recollections. There are now more than fifty different species known to the Phalaenopsis genus, and the group is growing larger each year. Orchid Digest Editorial comment: The pot plant market now controls the direction of phalaenopsis breeding, and species' influences will play a diminishing role in future development of this group. This is a great loss, because within the species resides a diversity of genes that will allow development of the genus in new directions. It is now up to the amateur orchid breeders and the International Phalaenopsis Alliance to keep the creative flame of phalaenopsis breeding alive. Christenson, E. A. 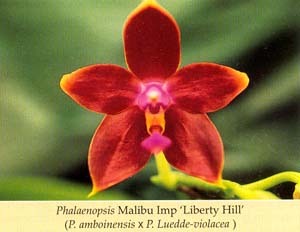 (2001) Phalaenopsis : A Monograph. Timber Press, Portland. 330 pp. 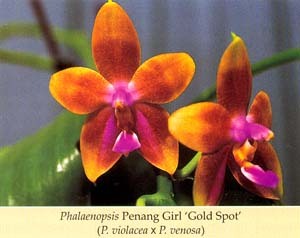 Sweet, H. R. (1980) The Genus Phalaenopsis. Orchid Digest Corp. Pomona. WebMaster comment: More photos of the species and primary hybrids mentioned in this article can be found in the Photo Gallery on this site. This article which has been reprinted here with permission, originally appeared in the Volume 66, Number 4 edition of Orchid Digest, (Oct-Dec 2002), which is a Special Edition that highlights Phalaenopsis, and also features an excellent article on Phal culture by the Tuskes. The Phalaenopsis Special Edition of Orchid Digest can be ordered from Orchid Digest for $22. Highly recommended. are copyright 2002 by Orchid Digest Corporation.